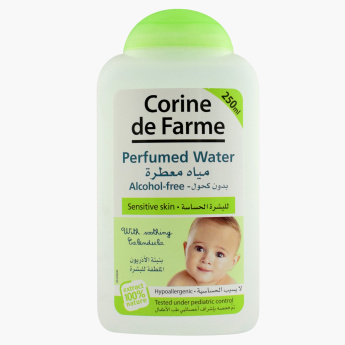 Corine de Farme Perfumed Water - 250 ml | Multicolour | Corine de Farme baby perfumed water has a gentle, fresh fragrance leaving your baby smelling clean and fresh. Ensure that your baby smells clean and fresh with the help of this gentle perfumed water. Offering a fresh fragrance, this perfumed water is alcohol-free and is dermatologically tested making it safe for your kid. Feature 1 : Corine de Farme baby perfumed water has a gentle, fresh fragrance leaving your baby smelling clean and fresh. Feature 2 : Alcohol free. Dermatologically tested. Hypoallergenic.